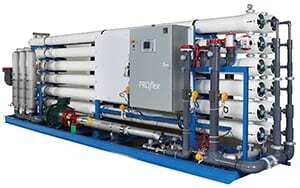 The PROflex reverse osmosis (RO) system (photo) features a new online product configurator that allows users to select the exact flowrate required by an application from a range of PROflex RO products. The recently redesigned system has a smaller footprint than previous models and boasts several design features that enable systems to be designed for specific flow, flux and water requirements. Ten base configurations are available with up to 72 8-in. elements. Various pump sizes are available, along with many options for instrumentation and programmable logic controllers (PLC). Simplified piping streamlines cleaning and modifications, and the pump has been placed in front of the skid for easier maintenance access.— GE Water & Process Technologies, Trevose, Pa.